Gelleesh: Unveiling my 2015 Wish List - Bookmark This, Please? Unveiling my 2015 Wish List - Bookmark This, Please? The first half of the year has been pretty good for me. I'm currently opening up a business, opened up some investments, got a promotion, was able to travel with my partner, and even booked another travel going to Davao on our birthday on September! 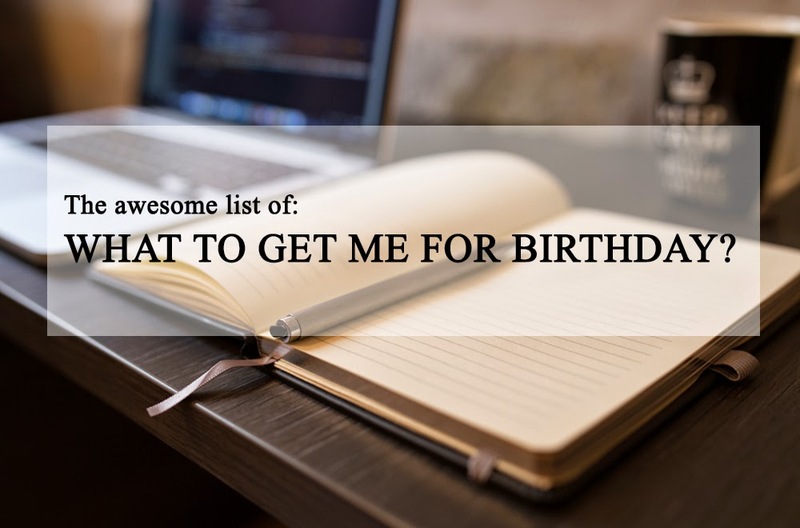 And speaking of birthday, I guess I would want to create a more reasonable (and practical) wish list. Last Christmas, my partner got me a Shu Uemura Eyelash Curler which was on top of my wish list for last year. So I guess, wish lists help people get other people gifts they may need and will surely love (?). If that isn't a good thing, I don't know what to call it. We're making your lives easier by creating a public wish list, no? Calling my family, friends, my partner, and everyone else who loves me. Teehee. Here's my list for this year. I already had two power banks before, but sadly, they already left me and my battery to die in the absence of an electric outlet. I guess because I was fond of buying inexpensive power banks I just got what they're really worth. So, maybe, if someone else will think of giving me a power bank, don't go cheap please? When my partner and I joined an Ilocos tour last January, someone accidentally spilled water on the van's floor and all of our stuff got wet... Except for my boyfriend's. His bag is waterproof and all that wicked travel pizzazz so it was saved. I guess I need a waterproof travel backpack bag or whatever you call it. I'm not a kickass traveler so forgive the words I use. My partner is so gonna kill me. I want some new wicked plussize gym clothes to keep me motivated while working out. Not just that, actually, because to tell you quite frankly I don't have much workout clothes but two jogging pants (one is my college jogging pants even) and some shirts. I want something that can be stretched and can help me move around better. Do you know any shops/stores that sells plussize workout clothes? Please share them at the comments section below so my loved ones will know where to look. Hehe. Fine. Summer is almost over but who says you cannot own swim wears even if it's not the summer season? I wasn't able to go swimming during the summer but I'm kind of hoping I can on September when I go to Davao with my partner for our birthday celebration (yes, we share the same birthday). I know of some Instagram shops selling plussize swim wear and, of course, there's the Plump Pinay girls who now have their own swim wear line. Take your pick! Really great idea of post! I just never have the time to post this kinda post! Haha. I would highly recommend anker power bank! You can get it from amazon easily. I bought one myself and you can check it out on my blog! ^__^ They have different ones but I think all are good, make sure you read other reviews! Their price range is pretty decent too & they charge up to 1/2 times for the one I have. I have 3 power banks hahaha but 2 of them seem to have declined na? One is Sony and the other one is a cheapy I got from Landmark. I also have one I bought at Mustafa for 26SGD (10000+ mAH!!!) but it stopped working after maybe 10 charges LOLLLLLL. Hope you get at least one from your wishlist! amazing wish list! I hope you get everything and more! :) I recommend the powerbanks at Digital walker! They have nice ones but not-so expensive. :) ITs what i use!